TEHRAN (Tehran Times) – Iran’s part of the Kazakhstan-Turkmenistan-Iran will be completed by October, Deputy Foreign Minister S.A. Araghchi said during a briefing at the Foreign Ministry of Kazakhstan. The North-South Transnational Corridor is a 677km-long railway line connecting the Central Asian countries of Kazakhstan and Turkmenistan with Iran and the Persian Gulf. It will link Uzen in Kazakhstan with Gyzylgaya-Bereket-Etrek in Turkmenistan and end at Gorgan in Iran’s Golestan province. In Iran, the railway will be linked to national network making its way to the ports of the Persian Gulf. The project is estimated to cost $620m which is being jointly funded by the governments of Kazakhstan, Turkmenistan and Iran. Construction of the rail lines is in progress in the three countries. Araghchi noted that Iran pays great importance to the project, and will do its best to complete its part of the road by October. The overall length of the Kazakhstan-Turkmenistan-Iran railway is 900 km (Iran: 70 km; Turkmenistan: 700 km; and Kazakhstan: 130 km). The Islamic Development Bank is financing Turkmenistan’s part of the road, and over 30% (over 250 km) of 700 km have already been completed. The Iranian company Pars Energy is responsible for the construction of this part of the railway. 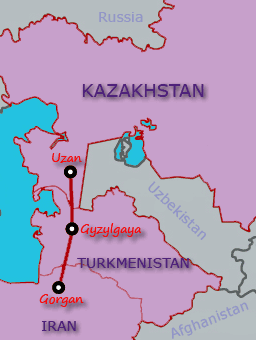 In 2008, plans have been made to connect Kazakstan to Iran via Turkmenistan. Previously in 1996, Mashad–Sarakhs extension connected Iran to Turkmenistan, as part of the Silk Road railway to link to the landlocked Central Asian Countries. However, former states of the Soviet Union have railways using a 1,520 mm (4 ft 11 5⁄6 in) wider gauge, thus the Iranian Railways maintain break-of-gauge services at borders to Azerbaijan and Turkmenistan, and beyond brief wide-track rail segments to the border crossing. In Turkmenistan, the work on the transnational corridor commenced in Bereket in December 2007 and in Kazakhstan in July 2009. Kazakhstan has, however, put the project on hold for 18 months due to the current financial crisis. As of July 2010, about 300 km of rail track was laid in Turkmenistan. The remaining 377 km was scheduled for completion by the end of 2010. The rail line will have 10kV overhead power lines, distribution and supervisory control, and data acquisition (SCADA) system. SCADA is a centralised system that monitors and controls the trains operating on the entire rail system. Most of the operations are controlled with the help of an automatic remote terminal unit (RTU) or by programmable logic controllers (PLCs). Data acquisition includes meter readings and status reports which are compiled and formatted in a way required by the control room operator using the human machine interface (HMI). Based on the data the HMI decides, adjusts and controls the train operations. Data can also be saved in the database management system for auditing purposes. The communication system involves installation and commissioning of the mobile train radio communication (MTRC) system.